Uruguayan authorities have ordered a fishing trawler to return to Uruguay, after a two-week pursuit at sea by Australian customs officials. Australia believes the trawler Viarsa has a huge cargo of illegally-caught Patagonian Toothfish - a rare delicacy that can be worth up to $23.50 a kilo. The Australian vessel had been trying to stop and board the Uruguayan-registered trawler after it was found in Australian waters, allegedly fishing illegally. A spokesman for Australian Fisheries Minister Ian Macdonald insisted the Viarsa should be subject to Australian law. "We've told them we want the vessel to come to an Australian port or a port deemed suitable by us and that's what we'll keep telling them," he told AFP. Uruguay is not thought to have given any guarantee that the trawler will be impounded when it reaches the South American country. The rare fish are highly prized on the American and Japanese markets; a single shipload is estimated to be worth about $2m. The Australian fisheries patrol ship, the Southern Supporter, has chased the Viarsa for more than 1,900 nautical miles and caught up with the vessel about 1,100 nautical miles south-west of Cape Town. A South African ship, the SA Agulhas, complete with armed men and a helicopter, was also closing in on the ship from another direction. Uruguayan fishing director Captain Yamanda Flangini told the Australian Broadcasting Corporation there was radio contact with the vessel and it had submitted to arrest orders. "It is under the power of Uruguayan authorities with orders to go to Montevideo," Captain Flangini said. The United States has said it will stop any of the ship's suspected catch from passing through its ports. The Australian fisheries minister said: "The support offered by the United States, South Africa and other nations will send another strong message to ship masters and companies involved in toothfish poaching that the risks of apprehension are growing rapidly." The Viarsa, a long-line trawler, was first seen inside Australia's fishing zone about 4,000 kilometres (2,500 miles) south-west off the coast 10 days ago. It repeatedly ignored radio orders to stop. 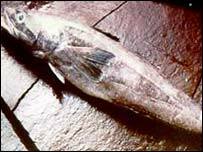 The Patagonian toothfish lives mainly in Antarctic waters and can reach more than two metres (yards) in length. It lives for up to 50 years and does not breed until it is at least 10 years old. 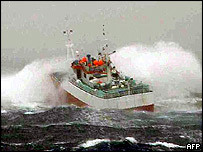 The Australian Government warned in 1998 that if pirate fishing continued at present levels, the toothfish could become soon become commercially extinct. Conservationists warned in 2001 illegal, unreported and unregulated catches were running at four times the level scientists had thought.